United step up chase for German defender | The Transfer Tavern | Where football transfer rumours fly or die! Manchester United fans in the Football Transfer Tavern were left noticeably excited after reports in Metro suggested that Sir Alex Ferguson was set to land highly rated Hamburg defender Jonathan Tah. 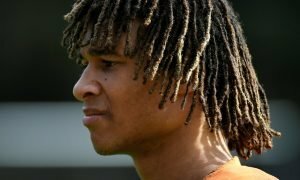 At just 16-years-old, the centre back is one of the brightest young talents in European football and Ferguson is keen to ensure that he begins his full career progression at Old Trafford under his watchful eye. The German Under-17 international is yet to sign a new contract at Hamburg and there have been suggestions that he believes his future now lies away from the Imtech Arena. Bundesliga leaders Bayern Munich were thought to be leading the race to capture the defender and Arsenal are also known to have interest in the centre back but it is now thought that Ferguson is willing to offer better terms to lure him to Manchester. The German club will be able to claim compensation to allow Tah to join the Old Trafford outfit but that fee – expected to be around the £300,000 mark, is unlikely to put off United who are keen to secure their man in the upcoming transfer window. Tah Tar Germany, Hello Old Trafford? Vote in our polls below.